Tax deductions reduce your taxable income, which reduces the tax you owe the IRS. 3. What If I Gave the Wrong Mileage on My Tax Return by Accident? When you forget to claim a tax deduction in a previous tax year, your income tax bill is generally higher than it should have been. The Internal Revenue Service allows you to file an amended return to recover any deductions you missed from a previous tax year. Although you will generally receive a refund for any overpayment within 12 weeks from filing the amended return, the IRS does limit the number of years you can recover a tax deduction to three years. Obtain Form 1040X, Form 1040X instructions and Form1040 instructions from the IRS website, as of 2011. Because Form 1040X is a general form used for several tax years, the information included in the instructions might not contain accurate figures, which is why you should also obtain the 1040 instructions. Check the box that pertains to the year you are amending and list your personal information in the top part of Form 1040X. If you're filing jointly with your spouse, enter your spouse’s personal information. Select a filing status. Because you are not amending your filing status, refer to your original tax return to determine which filing status you claimed initially. Complete Column A using the information from your original tax return. Refer to your original tax return to determine the location of the deduction. If the deduction is located in the “Adjusted Gross Income” section of Form 1040A or 1040, include the deduction amount in your adjusted gross income on Form 1040X, as of 2011. For example, if you forgot to claim $250 in educator expenses and your adjusted gross income was originally $55,000, your amended adjusted gross income is now $54,750. 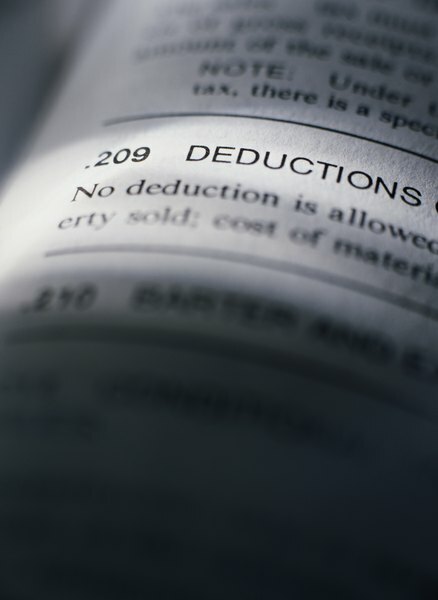 If the deduction is located on Schedule A, you must recalculate your itemized deductions. Complete any supporting documents required to claim the deduction. For example, if you're claiming the health saving account deduction, you must complete Form 8889. If you are claiming the tuition and fees deduction, you must complete Form 8917. To recalculate your itemized deductions, you must complete Schedule A. To verify whether you must complete any additional forms to calculate and support your deduction, refer to the Form 1040 instructions. Enter your new adjusted gross income in Column C in the line labeled “Adjusted Gross Income” on Form 1040X. If the deduction is not included in the adjusted gross income portion of your original return, enter the amount from Schedule A in the line labeled “Itemized Deductions or Standard Deduction” on Form 1040X. Subtract the amount from Column C from Column A to determine the amount of the change. Enter the difference in Column B.
Subtract your itemized or standard deductions from your adjusted gross income and enter this amount in the corresponding line of Column C. Subtract Column C from Column A and enter the change in Column B. Copy the amount from Column A in the line labeled “Exemptions” to Column C. Because you aren't amending your exemptions, this amount should be the same as it was on your original tax return. Perform the remaining calculations in the “Income and Deductions” section to determine your taxable income. Subtract Column C from Column A and enter the change in Column B. This is the income that the IRS will use to determine your tax. Refer to the tax table located on the 1040 instructions to determine the amount of your tax. Match your filing status with your taxable income and write the amount in the line labeled “Tax” in Column C. Subtract Column C from Column A and enter the change in Column B. Refer to your original return to determine whether you claimed any additional credits. If you did, you must recalculate them and report the change. Most credits require you to complete a form to determine your credit. For example, if you claimed the additional child tax credit, you must complete a new Form 8812, or Form 8839 if you claimed the adoption credit. Report the correct amount in Column C and subtract Column C from Column A to determine the change. Enter the change in Column B. Copy the amounts listed in Column A to Column C for any lines that you are not amending. Perform the remaining calculations on the first page of Form 1040X to determine the amount of your refund. Enter your reason for filing the amended return in "Part III" on the second page of Form 1040X. For example, if you are filing the form to claim the tuition and fees deduction, write “Claiming the Tuition and Fees Deduction” in Part III. Sign and date Form 1040X. If you are filing a joint return, your spouse must also sign and date the form. Attach any supporting documents in the order described in the 1040X instructions. Mail your return to the address listed in the “Where to File” section, which is also located in the form’s instructions.